Despite his small stature (5'9", 170 pounds), this Giant outfielder stands as a colossus among the game's sluggers. Ott's unique leg kick enabled him to generate the power for 511 home runs, the first man in NL history to hit 500. He led the NL in homers six times, in HR percentage 10 times, but in RBI only once. 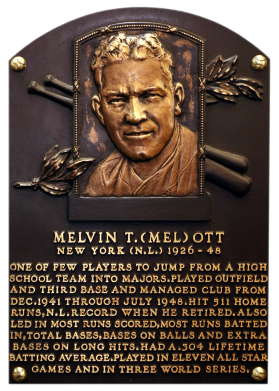 When he retired in 1947, he held the NL career mark for homers, runs scored (1,859), RBI (1,861), and walks (1,708). "Master Melvin" retired with a .304 average. 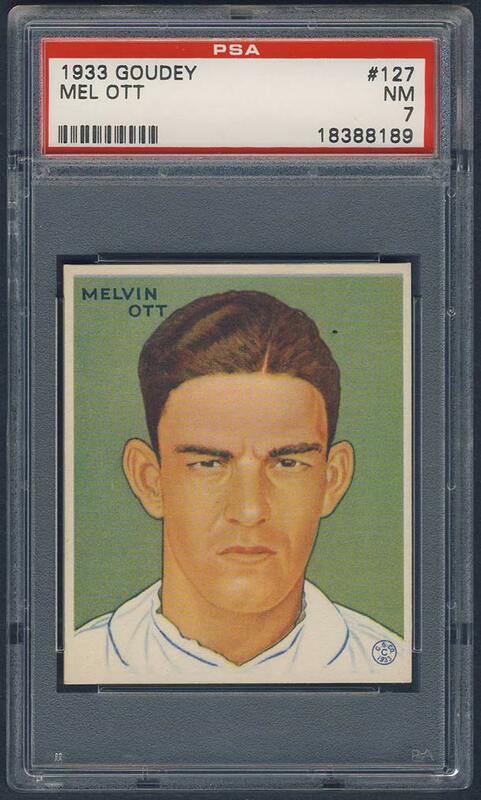 Comments: After researching various Mel Ott cards, the 1933 Goudey #127 was my favorite portrait and Marion Owens (Maraya Sportscards) sold me a PSA 7 example in August, 1999. I later sold the card in July, 2003. Within days I found a PSA 5 replacement and later upgraded to a PSA 6 the following month. In November, 2004 I upgraded again to a PSA 7 with another eBay buy. Then in May, 2007 I was swapping lots of cards in the collection out with new types. 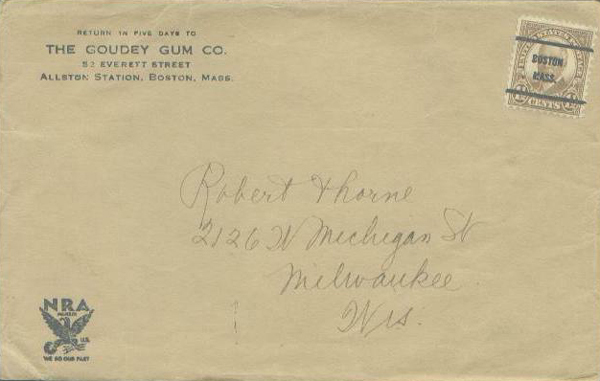 I made a mistake and sold the 1933 Goudey (one of my favs) in order to replace it with a 1939 R303-A Goudey Premium SGC 50. I figured I had the 1933 Goudey issue covered with Bill Terry and Goose Goslin. And, it was a way for me to diversify the collection since I didn't own a R303. Fortunately, Joe Gordon was elected to the Hall of Fame and he had a 1939 R303-A card so I bought one. 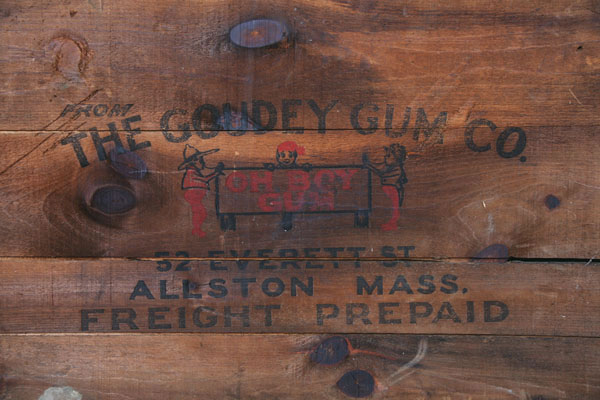 I also replaced the 1933 Goudey Terry with a 1934 World Wide Gum example, and am looking for 1934 Annis Furs Goslin. 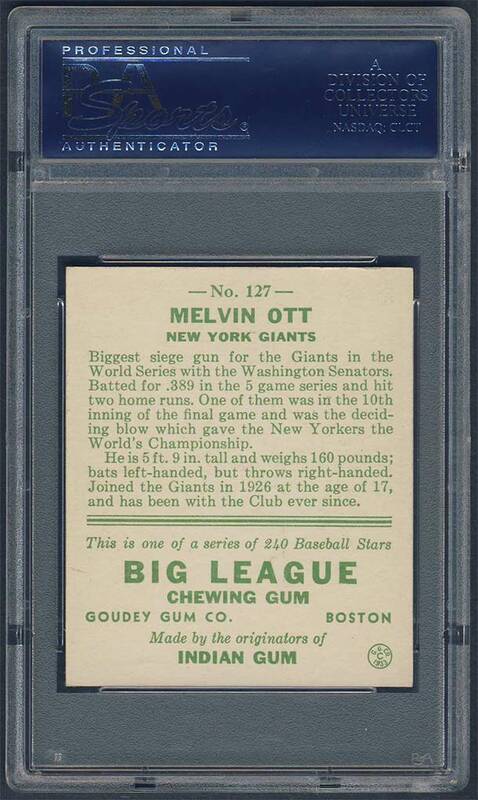 So, 1933 Goudey issue could once again be covered by Mr. Ott. So, in March, 2010 I purchased a PSA 6 example on eBay. This is one I'd really like to upgrade to a NM-MT copy someday. 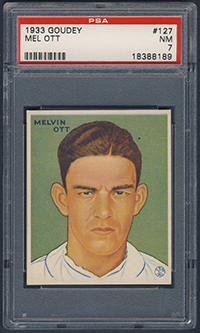 UPDATE: While on vacation in Alaska with family, a beautiful 1933 Ott showed up on eBay with a BIN of $1299 in late June, 2016. I had been looking for a PSA 8 to upgrade my off centered EX-MT example. This particular one was slabbed NM. Mel’s stare was surrounded by fantastic, bright lime green color. Every aspect of the card appeared better than the assigned grade. The only issue with the card appeared to be a tiny print dot to the right of the sluggers face. Unfortunately, there was no Best Offer option but I had to try and contact the seller to negotiate a better price. The SMR listed NM copies at 750 and NM-MT examples at 1850. 7.5s were at 1150. After reaching them through the eBay communication tool, they called me back and talked up the card from their personal collection. They assured it was every bit as nice as the scans, appearing pack fresh in every manner. Considering 12% eBay/PayPal fees, we were able to wiggle a little off the asking price by offering a payment transfer which wouldn’t dock the seller. After several days of negotiation, we settled on a discounted price of $1199 + $20 S&H outside of the commerce site. I didn’t think it was going to happen because the price was still a little high. But, after looking at the auction several times throughout the process, I couldn’t walk away. The card was just too nice to pass up. I bit and hope to have the item re-evaluated upon receipt. Hopefully, PSA will agree and bump the card to a higher grade. 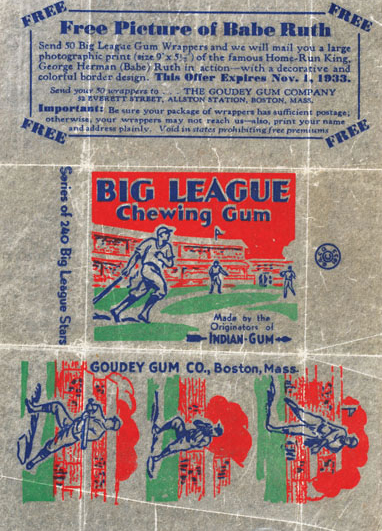 Description: Goudey Gum Co.'s first baseball card issue was a 239-card effort in 1933. The cards are color art reproductions of either portrait or action photos. The numbered cards measure 2-3/8" X 2-7/8" and carry a short player biography on the reverse.